Over the years I have enjoyed all the WorldMark places in which I have stayed; Australia as well as the U.S., Mexico and Fiji. Kirra Beach resort remains one of my favourite places to visit. Being less than two hours drive from my residence I usually manage to get down there a couple of times a year. 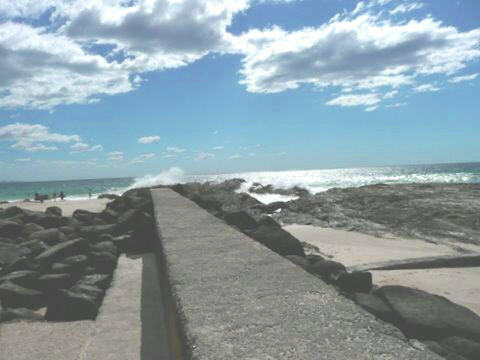 Kirra allows me to start my morning slowly, with a walk into Coolangatta to enjoy a leisurely breakfast and get the blood pumping, and then when I am charged and ready for the day I head up around the headlands to Rainbow Bay, Snapper Rocks or even up to Point Danger if the energy lasts. When the surf is pumping I always take a break in my walk at Coolangatta point to watch the surfers as they catch the waves off Rainbow Bay rocks and ride the sweeps all the way around to Coolangatta Beach, it’s a great way to spend some time on a sunny winter day. Some of Australia’s best surfers are based in the area so you never know who might be out there. One of the other things I keep my eyes open for are the passing whales. Sometimes they can even be seen from the unit balcony, but I have also had some great sightings from Coolangatta Beach and up on Point Danger as well. Always looking forward to my next visit to Kirra. This entry was posted in (QLD) Gold Coast and tagged australia, holiday, Kirra Beach, travel, vacation ownership, whale watching, worldmark, Wyndham Resorts. Bookmark the permalink.